The timing of cataract surgery is an individual decision based on your daily activities and visual needs. Cataracts will cause vision to deteriorate over time. When your reduced vision affects your activities, such as the ability to drive or read, you may choose to have cataract surgery. Your surgeon can help you assess the risks and benefits of cataract surgery and how it can improve your lifestyle. When the patient and surgeon decide it’s time for cataract surgery, the cataract is surgically removed and replaced with a clear intraocular lens implant. Since only a tiny incision is used, neither stitches nor a patch are usually required after surgery (sometimes referred to as “no-stitch, no-patch cataract surgery”). At Coastal Eye Institute, we use an advanced surgical technique called phacoemulsification, which in some cases is combined with laser technology. The cataract is broken apart using ultrasound and sometimes laser before it is gently removed. The lens implant is inserted through a small incision and unfolds once inside the eye. This technique usually takes less than 15 minutes to complete and allows the eye to heal more quickly with minimal discomfort. Patients who have surgery in the morning are usually home in time for lunch and may watch TV the same day. Please watch the video below to learn more about cataract surgery. With recent technological advancements in cataract surgery, surgeons now have options that allow patients to make informed decisions on how their cataracts will be removed. Patients can choose between Basic cataract surgery (not using laser or advanced lens implants) and Advanced Laser Refractive cataract surgery. 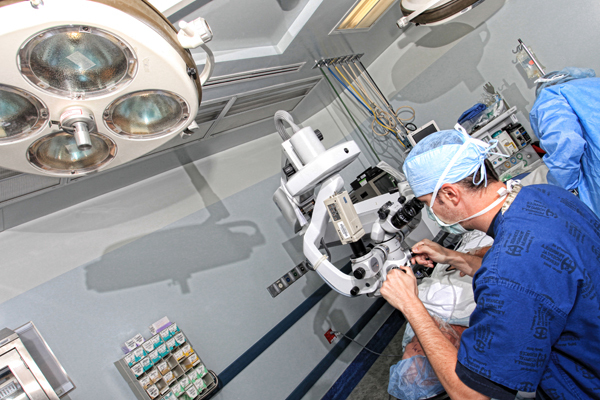 To learn about laser cataract surgery, click here. Yes. In many instances advanced lenses can be utilized to allow patients to reduce or eliminate their need for glasses. Not everyone is a candidate for the advanced lenses, but your surgeon will assess your vision and the health of your eye and discuss your options with you. If you would like to learn about these lenses click here. Thanks to the micro-incision technique, you will go home the same day as your cataract surgery, be able to watch TV that night, and resume light activities. Eye drops are prescribed to help prevent infection and swelling after surgery. Your surgeon will continue to monitor your progress during your post-operative appointments. If you need glasses, you will be fitted about 2-4 weeks after the procedure. Cataract surgery is a once-in-a-lifetime procedure. Cataracts do not grow back. However, in some patients, the membrane that is behind the cataract that holds the lens implant becomes cloudy after surgery. This is called “posterior capsule opacification” and can cause glare, sensitivity to lights and decreased vision. If this occurs, your cataract surgeon can usually restore your vision with a painless laser treatment. Please watch the video below to learn more.